For a year or two now, “growth hacking” has been one of the marketing industry’s biggest buzzwords. While the term means different things to different people, it roughly translates to quick, simple, and often very inexpensive marketing “tricks” designed to explosively grow a product or service. A classic example of growth hacking is in how Dropbox grew its user base by incentivizing the refer-a-friend process. In fact, the guy who originally coined the term “growth hacker,” Sean Ellis, was a marketer at Dropbox during this time. Dropbox offered free additional storage to users who invited their friends to the service, rewarding 500 MB extra space to both the inviter and the invitee, up to a maximum of 16 GB. This “growth hack” really incentivized people to invite everyone they knew to Dropbox. PayPal did something very similar during its growth phase. Everyone who signed up for PayPal got $10. Then, if they invited a friend, they could get another $10 (and the friend could get their own $10 for signing up). This exploded PayPal’s signups. This kind of “double-sided incentive” is an obvious way to grow your audience, and definitely something you should take advantage of. 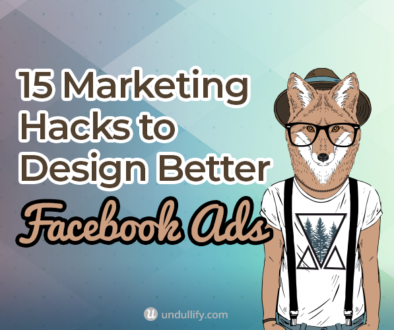 But beyond that, there are tons of other growth hacks you can make that will have a great impact on your bottom line. 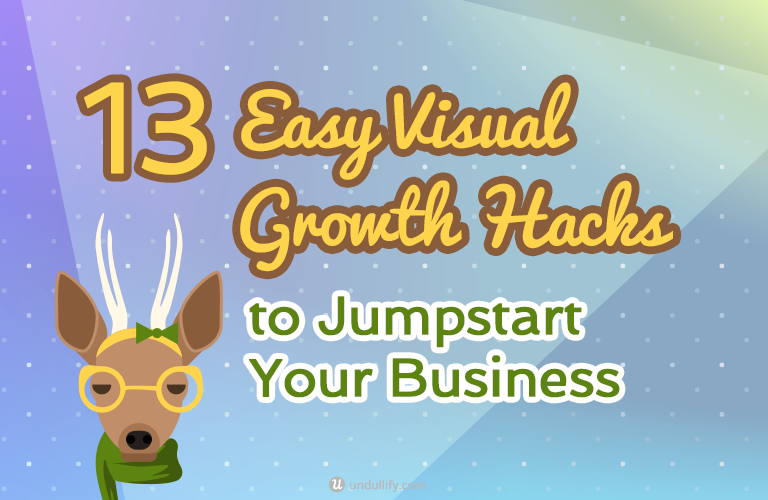 This list of visual growth hacks is a great place to start; all can be completed in a short amount of time but have a lasting impact on your audience and traffic. Buffer’s blog is a brilliant example of this practice – their highly informative marketing blog posts are chock full of graphs, charts, quotes, and other shareable images. This 1800 word post about social media logos contains a whopping 32 images, or one for every 56 words! 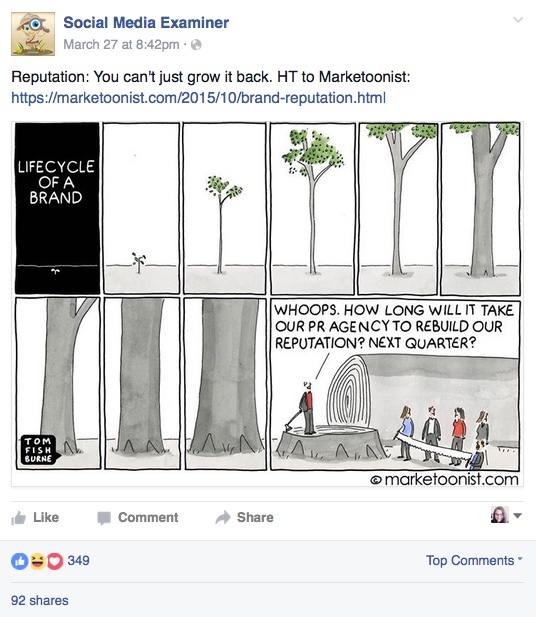 It was posted about three weeks ago and has already earned over 1200 social shares. Do This Now: Put together at least three visuals of some kind for your next blog post, whether they are photographs, charts, illustrations, or quote images. Even better if you can put together enough images to place one every 75-100 words. Need some help in creating these images? Take a look at how our unlimited graphics design service can help! Ever share something on Facebook and Twitter, and the website you were sharing from automatically pulled a beautiful and perfectly sized image to go alongside what you were sharing? The answer is open graph meta tags. These are a sort of universal optimization code that tells different social networks how to pull rich data, like titles, descriptions, and featured images, off of your website. Staggering reports were released about open graph tags when they first became available a few years ago, like how Tumblr’s Facebook traffic increased by 250% after they integrated with open graph, and while you may not see anything as dramatic, they still make a huge difference. Do This Now: If your blog runs on WordPress, you’re in luck – Yoast’s free WordPress SEO plugin can set your open graph meta tags for you with each post. Install the plugin and then follow these steps for Facebook and these steps for Twitter. Then, be sure to set default images that are the perfect size – Twitter will accept most anything reasonable, but Facebook is looking for an image that is 1200×628 pixels. If your blog does not use WordPress, you can use this generator for Facebook and this one for Twitter to create the code you need, and then test your pages to make sure they’re working properly with Facebook’s debug tool and Twitter’s card validator. Make sure at least one of them is a tall, attractive image, because these are the sorts of images that do well on Pinterest. In fact, according to Curalate, an aspect ratio between 2:3 and 3:4 is ideal, garnering 60% more repins than very tall images. Better Homes and Gardens is a Pinterest master, with over 1.2 million followers on their account. 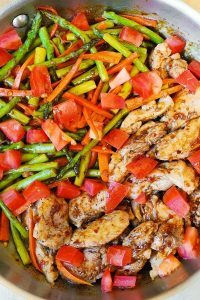 Their most popular Pinterest share from the last year, with over 328,000 pins all by itself, is this balsamic chicken recipe. 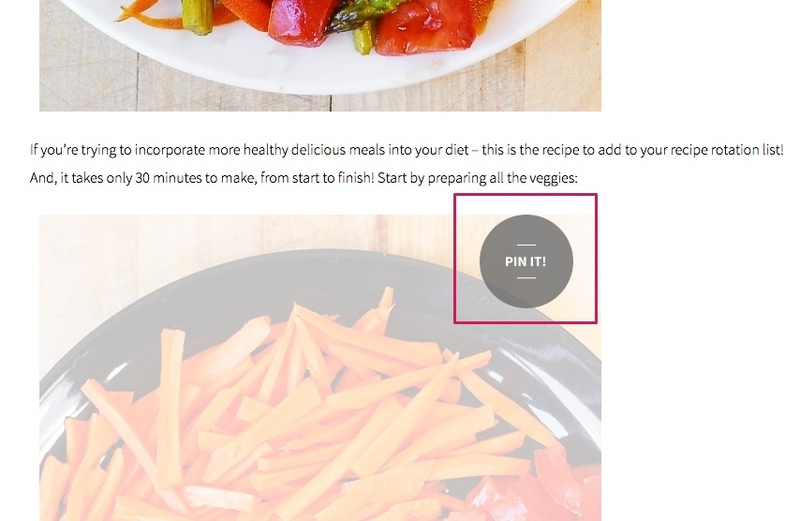 As you may have predicted, the images to go with that recipe are all a perfect 2:3 ratio. 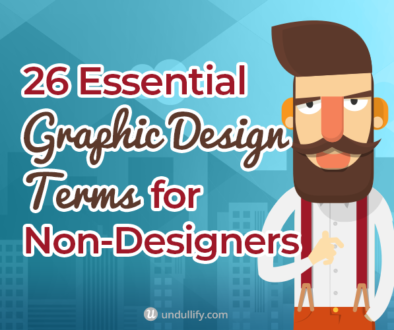 Do This Now: If one of your images is an infographic, great! You’re set. If not, try cropping your main image to a 2:3 ratio and adding the title of the post on top. You can put this image at the bottom for pinners to share. When you roll over any image on their blog, the image slightly fades out, and a subtle “Pin It!” button appears at the top right. It’s a convenient shortcut and a reminder all rolled up into one! Do This Now: If you run WordPress, you’re in luck! There are a wide variety of WordPress plugins to accomplish this task. 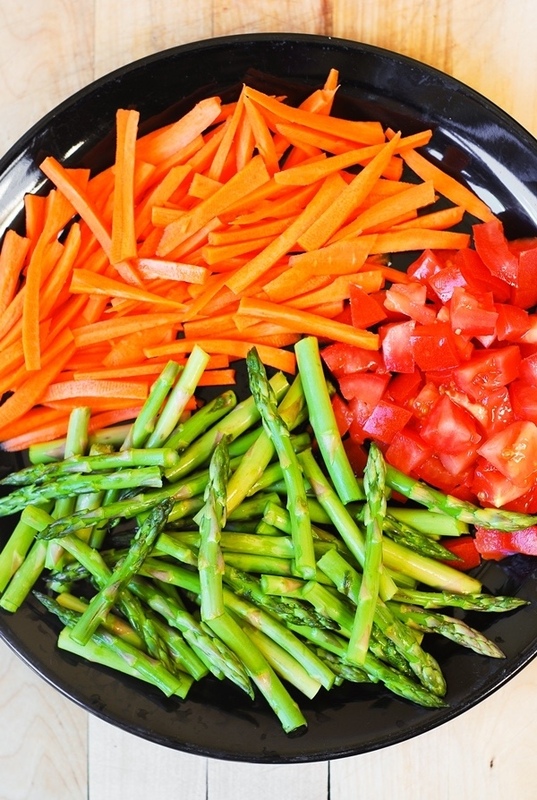 Check out WWM Social Share on Image Hover for a general free option, or jQuery Pin It Button for Images if you are looking for a customizable, Pinterest-only option. There are also premium options available. If you’re not running WordPress, you’re not totally out of luck, but you’ll likely need to manually add this feature into your website, which will take either time or money depending how handy you are with code. If you are saying something truly interesting or insightful on your blog already, why not highlight it and give your readers a prompt to share it by making it easy to click and tweet out? This is a great way to highlight your article’s major takeaways and also shape the way your content is perceived on Twitter. That quote is BOOM! obvious, and even better, it’s an intriguing quick tip that will get people on Twitter clicking through to his article to see what it’s all about. Do This Now: Once again, if you are running WordPress you have a wide array of choices. Two I would recommend are the free Click To Tweet plugin by CoSchedule, or Tim Soulo’s own premium plugin TweetDis, pictured above. If you aren’t using WordPress, you can create these as needed using the tool ClickToTweet.com. 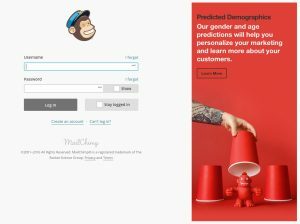 Chances are, if your product is an online tool or service, you have a lot of users logging in all the time. When they click “Log In,” don’t just send them to the same old boring login screen – use that real estate to tell them about cool things they can do with your product, or new features they may want to try. 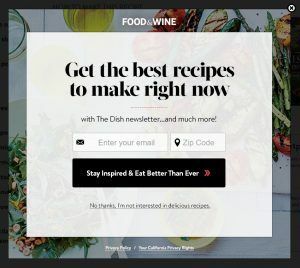 Do This Now: Instead of keeping a plain Jane login page, add a bright and attention-grabbing visual that explains a feature or recent update. Your “Point of Difference” (POD) is the feature or focus that makes your product or service completely different from that of your competitors. By standing out from your competitors, you grow your brand loyalty by giving your customers something to stick to. Snapchat is a great example of choosing a POD and really sticking with it. Early on, they identified that the 13-34 age group as one that preferred to use social media differently from older groups. These users were overwhelmingly visual sharers, and loved quick, “snappy” updates. Snapchat excelled at making a product that stood out from stodgier social networks and really appealed to this demographic. As a result, Snapchat now has over 100 million users, 45% of whom are under age 25. Do This Now: Identify your POD and make it a part of your company’s core identity. You can even go so far as to tie it into a message that appears on every page of your site. We’ve all seen them… those popups you feel bad closing, because the cancellation message is something ridiculously antithetical to what you actually think. But… I do love delicious recipes!! 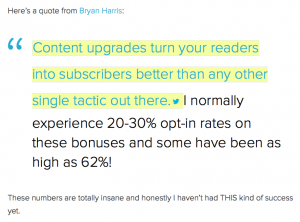 If you’re already using popups, run a split test with a few versions of the CTA and “no thanks” copy – maybe a more arrogant version will be more enticing to your visitors! Do you embed any videos you created on your website, such as help videos or product introductions? You are probably using YouTube, which is understandable. But when Google indexes these videos, the search results for them will point to YouTube, not your own website. Instead, upload your videos to Wistia to recover some of that SEO value. When Google indexes Wistia videos on your website, it will return results for your website, not for YouTube. In addition, Wistia automatically embeds video metadata, like transcripts, onto your website, further increasing your videos’ SEO value. Do This Now: Wistia offers a free, branded version that lets you upload up to 5 videos. Switch your videos over and start reaping the SEO benefits. It is really hard to come up with stuff to share on social media – and even harder when you realize you need a whole content calendar, month in and month out. One thing that can make it easier? Facebook series. Your series can be anything that appeals to your audience and gives you lots of content to use, whether it’s quote images, quick tips, or even industry memes. Just make sure it’s visual – photo posts and video posts get a lot more attention than plain text posts, and link posts will look a bit too much like the rest of the stuff on your timeline. After a while, your audience will come to recognize and expect these updates – especially if you create a hashtag to link them all together, such as #TipTuesday. Do This Now: Come up with a series-style topic your audience loves, and brainstorm, create, or curate lots of images to accompany it. Schedule them out for the next several weeks, all the way up to six months out (the maximum Facebook will allow you to schedule out posts). Congratulations! You’ve got a content series. Social proof – potential customers see that there is enough buzz around your products that their fellow fans are sharing images of how much they love your product. 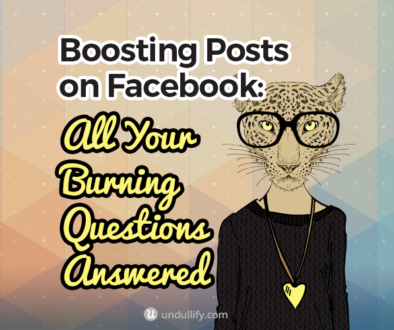 A growing body of curateable content for your social media accounts. Of course, this all begins with soliciting those product shots, somehow. Many brands ask their fans to tag them on Instagram or other social networks. Others collect the images directly, as a part of a contest or platform on their website. 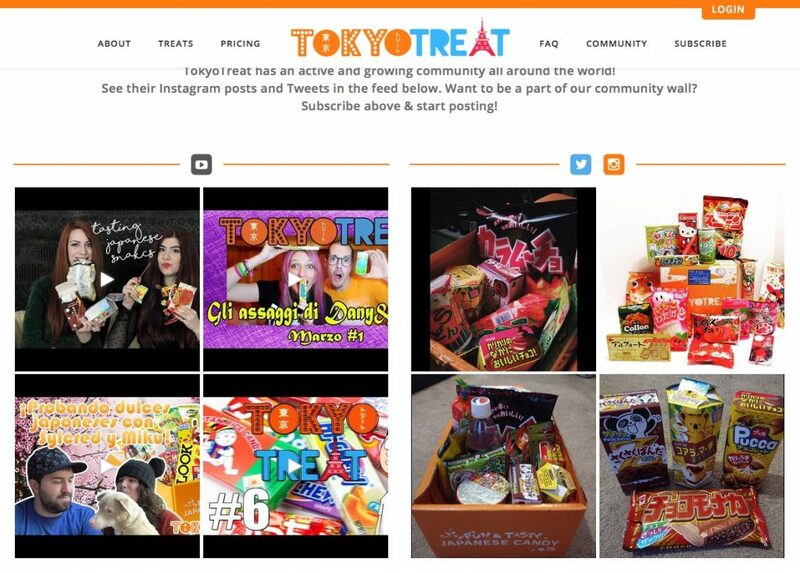 Tokyo Treat takes this growth hack one step further – they collect unboxing videos from their audience, sharing them on a dedicated “community” page of their website. 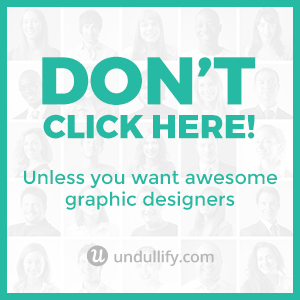 Do This Now: Got a visually appealing or engaging product? Invite your followers to share their shots with your product by tagging you or using a unique hashtag. If you need to jumpstart entries, offer an incentive, such as a prize, to a random winner or the best entry. This is one of the easiest and most powerful growth hacks in this article – if you are going to take any of these suggestions, take this one! Just post videos on your Facebook page. That’s it. Not YouTube videos, mind you – you need to upload them directly to Facebook. There are also a few best practices you should keep in mind; keep them short, snappy, and make the audio optional for understanding the message. 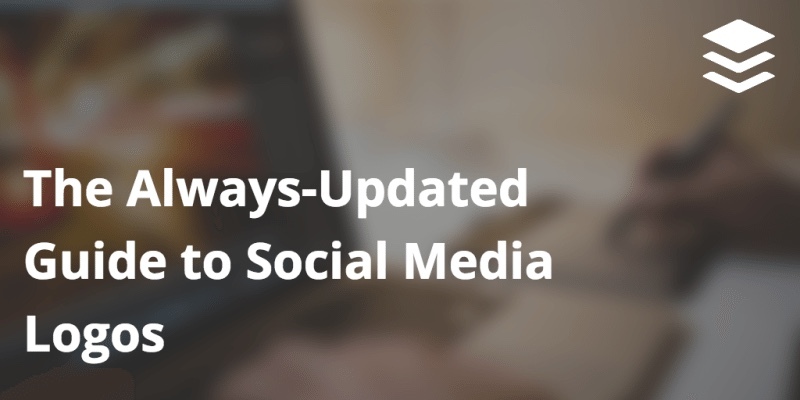 As your followers scroll through their Newsfeed, they will encounter your videos, which will autoplay unless they have a particular setting turned off (which they likely don’t). Free eyeballs! I’m going to go ahead and declare Buzzfeed the official king of Facebook video, because I see their videos way more than any other page’s. 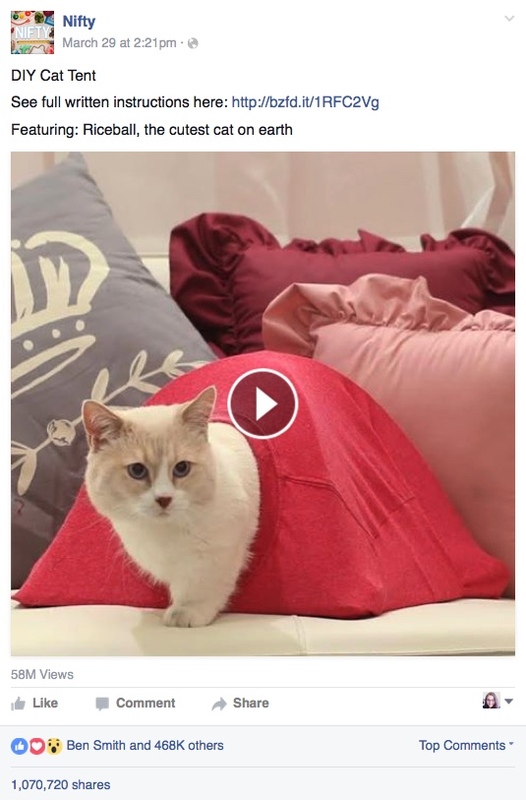 How else would a million other people and I learn how to turn a T-shirt into a DIY cat tent? 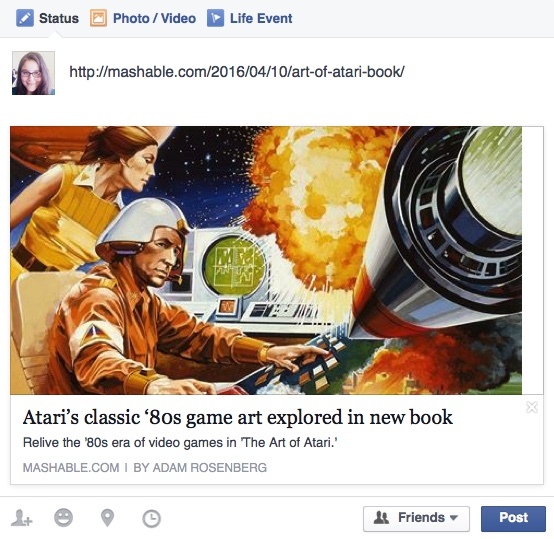 Do This Now: Just go upload a catchy video to your Facebook page. You’re welcome. To round out our list of visual growth hacks, you can never go wrong with a friendly note welcoming a new customer or thanking a repeat customer for their business. If you want to go really above and beyond, you can even impress your contacts with a handwritten note. It’s the same philosophy as with job interviews; a thank you email is expected, but these days, it’s a handwritten thank you that goes above and beyond. 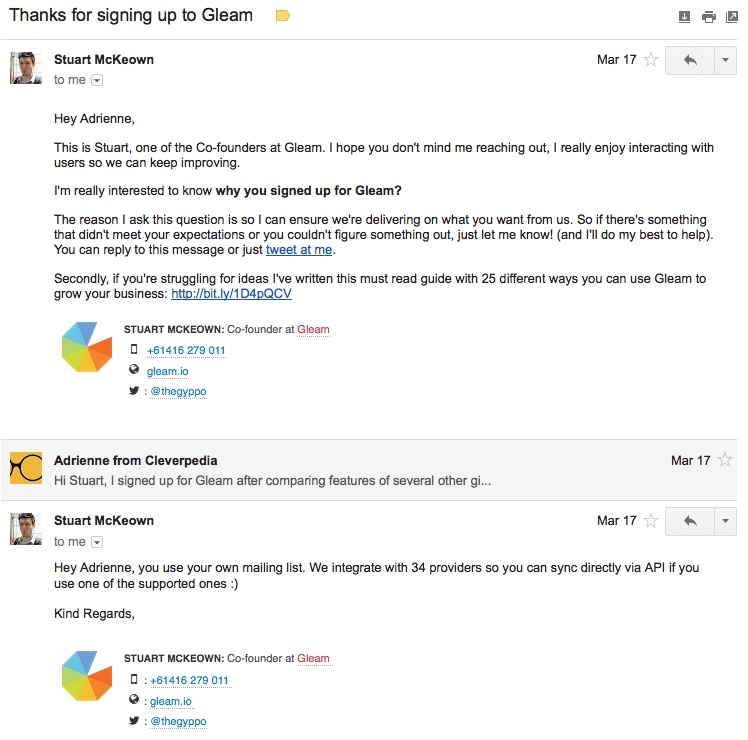 Do This Now: I expect that Stuart’s original welcome email was a well-crafted template that is automatically sent to all new Gleam users, but they do an amazing job making it sound friendly and personalized. Many email list providers have the ability to do something like this for you, you just need to set it up. If you want to go the extra mile with a handwritten note, you can grab some stationary and jot one out. But if you don’t have time for that, there are a few services that will do the writing and snail mailing for you – check out MailLift, Thankbot, and Bond, especially if you need to send a lot of these! There you have it – thirteen visual growth hacks that you can put into motion today to build your business! Remember, the most successful growth hacks are created with a specific audience in mind, so consider these ideas a template that you can adapt to suit your own core community. What are your favorite visual growth hacks? I’d love to hear them – share them in the comments below! Want to learn how to grow your online business through awesome design, creative visual content and clever growth hacks? We're going to show you how. Copyright @ 2019 Undullify.com. All rights reserved. All prices in USD.